Financial Investigator Jemima Cholmondeley-Smith, Detective Sergeant Kara Nicholson and PC Kate Woods were honoured at a ceremony recognising those who were involved in Operation Raptor 2, which was led by the West Yorkshire Regional Organised Crime Unit (ROCU). It related to police officer impersonation fraud, in which criminals conned elderly and vulnerable victims out of thousands of pounds. The total amount of money lost by victims nationally was £242,000, and around £40,000 by eight victims in Lincolnshire. 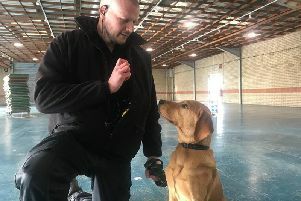 Lincolnshire Police, which had already been working on Operation Solitude, joined forces with West Yorkshire ROCU after the forces had identified that they shared some of the same suspects. While West Yorkshire Police focused mainly on telephone data, Lincolnshire Police made significant developments in terms of financial investigation. Eight men were sentenced to a combined total of more than 30 years’ imprisonment when appearing at Leeds Crown Court last September. Jemima Cholmondeley-Smith said: “We welcome recognition of the work we put into the investigation, but it is tinged with sadness that many of the victims have sadly died without seeing justice being served. “The individuals who have been convicted of this crime were relentless in their harassment of the victims in pursuit of their life savings. “We thank the victims and their families for their support throughout the investigation. “Unfortunately this type of fraud continues to be prevalent. We would like to remind people that police will never call and ask you for your bank details or to transfer or withdraw money from your bank account. “We’d also like to appeal to people not to be embarrassed if they find they have been a victim of this type of fraud – these offenders are callous, convincing and manipulative.